How many times have you woken up and looked into the wardrobe and asked yourself, ‘What on earth am I going to wear today?’. And then found yourself thinking, ‘I have nothing to wear?!’. And then screamed in your head about how much time you need to spend just deciding what to wear, or finding a hijab which matches the shirt, or even just finding an outfit to look smart but modest? This is every Muslimah’s nightmare and it really affects our productivity. In this article, we’re going to look at practical tips to organise your wardrobe so you can say goodbye to time wasted on just deciding what to wear. 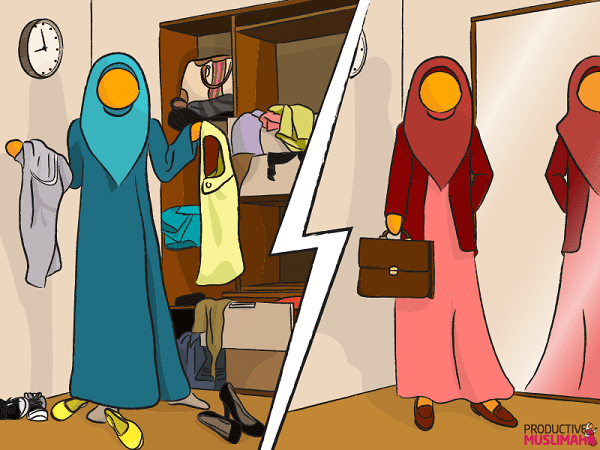 The above is a scenario I know many of you will share, I like to call it the Muslimah’s wardrobe dilemma and I’m going to help you sort it out! Many sisters spend an hour (or more!) to get ready and out of the house making it a BIG time stealer! I know the feeling of a closet nightmare but I’ve learnt over the years how to get SMART with my wardrobe, so now I can get ready in 30 minutes (that includes the time it takes me to use the bathroom!) and get out that door instead of spending hours trying to decide what to wear. Islam encourages us to dress well as the Prophet always made an effort to be well presented and took care of his appearance. It is also important to look good and clean as a Muslim since it reflects a strong impression amongst our non-Muslim colleagues who see us and our faith. Every Muslimah has her own style or ‘look’ so this article isn’t about the style. Rather, it is about using the “Top 5 Wardrobe Hacks” to get productive and get your wardrobe organised so you don’t face this time-stealing “what to wear dilemma” every morning. These hacks have helped me a great deal, and receiving many questions from my sisters asking me how I manage to find some of my wardrobe items, I thought it was time to share the my closet secrets and top five hacks to live by in order to get productive with your wardrobe. Firstly, to be productive, you have to get that wardrobe organised! I found it really helpful to organise my clothes so that similar colours and shades were in the same place. This way, I am able to quickly match my outfit with the right hijab shade (I know it’s hard work finding the right hijab)! This also meant that I could see what colours I have already for any future shopping trips where I bought new items as I like to buy shades that match outfits I already have. Update your wardrobe and give it a revamp every time the season changes. This means packing away the summer dresses and getting the scarves and knitwear out during winter. This will also create more room in the cupboard and ensure you have the right kind of clothes for that time of year.Some items of clothing which we tend to need every winter are worth investing more money into, I recall buying a good coat whilst at University which lasted me years and saved me buying a coat every year. We all hate to admit it, but us women just buy way too much clothes we don’t need and if we looked in the closet, we’d find so many items that are just lying there!I regularly have a de-clutter session (Mum’s nagging helps! ), which allows me to sort through clothes that I no longer wear and bag them up to donate to charity or sell them off. De-cluttering also has a positive impact on you mentally and spiritually since we shouldn’t be attached to material things. Just see how much better you feel after a de-clutter session.Note: De-cluttering sessions are NOT a licence to go buy more clothes! A rule of thumb for me when I go shopping is never to buy an item that I may not have a matching hijab with. So be SMART and only buy items of clothing that you already have a matching hijab for. Plain coloured hijabs also seem to be more smart and ideal for matching with other clothing items rather than floral prints, unless you wear them with plain clothes. This is also economical, for I found that I didn’t have to go spend extra money to find a matching hijab for the new clothes I just bought — which is just another time waster! Personally, some of my favourite colours include purple, teal and pastels as these are rich colours. But I also like to buy black, navy and beige items, which are suitable for work and can be easily matched with any other colour. This can help save lots of time and headache, I assure you! Only for special occasions like weddings or events do I make an exception to this rule. One of the most common reasons sisters are running late for work or something else is probably the indecisiveness on what to wear! This means you need to think about the appropriate outfit and decide the night before. I usually decide what to wear based on whether I have an important meeting and if I need to make a special effort for. Depending on the engagement, I will choose a smart or casual look. If I don’t have any external meetings, then I tend to go for a more relaxed dress code. For a corporate environment, sisters may need to wear smart as it reflects your organisational culture. Also, dressing well is part of Islam as it reflects our level of professionalism. Once you’ve decided, iron it and get it ready on a hanger. Trust me, this makes your morning much more productive and smooth as you chuck on clothes instead of rummaging through the wardrobe when you’ve got kids to rush to school or a meeting to run to. Some nights I’d just decide and locate the items I’d wear the next day, ensuring they are matching. And then I feel so much at peace knowing I’ve sorted that out for the next day. I wouldn’t consider myself a shopaholic as I really dislike hours on end of shopping (I am much more of a person who buys what I need and just get out of there). However, once I get my eye on a good sale, it’s hard to drag me away from bargain hunting! I’ve often bought great items of clothes at half their original price and amazed my colleagues/friends. This has helped me save loads of money and also meant that I don’t unnecessarily spend money on items I don’t need. Sometimes, I’ll invest in an expensive good item if I see it would be useful as a long-term investment. Then, I make it a rule that if I’ve done some bargain shopping for the month, that I won’t shop again for the remaining days of the month. Also I’ve found that online shopping during discount periods saves both the physical time wasted in getting to shops and also exclusive buys. Finally one of my other wardrobe secrets is that I’ve bought clothes from charity shops. Although some people frown at this thought, I can assure you some great clothes are donated to charity shops, and what’s even better is that your money goes towards a good cause so your clothes has blessings in it! Also ethical clothing and socially conscious fashion is an new trend such as buying Fairtrade clothing which can help people out of poverty. This wardrobe hack is useful for mums and all sisters alike as it has helped me mix and match items on many occasions. What this means is buying items that you know you can make use of on more than one occasion, such as an evening dress which is elegant and understated for both wedding or work evening functions. Other multipurpose buys include colours you know you often wear so that you can match them up with clothes you wear often. In my case, I like selecting long sleeve tops that can cover my hands, which can double up to make a modest dress under sleeveless shirts. Another thing I find helpful is long skirts in corporate colours that I can mix and match with different blouses. For sisters who wear the abaya, I find it always helps to buy the type that can be worn comfortably in certain weathers/occasions, such as open jacket abayas for the summer or weddings as well as shawls/capes to throw over when in a rush or on an evening out. Some of my favourite places to buy modest clothing online include Silk Route, Aab, The Closet and Essence of Hijaab as well as Pearl Daisy for hijabs. Souk bazaars and markets can also be a good place for reduced off the high street wear, and local high street shops like H&M and New Look are some of my favourite places for my professional wardrobe pieces as well as Accessorize, Monsoon and Zara for the slightly more higher end products. So there you have it. These are the top five wardrobe hacks for a Productive Muslimah. I hope you will use them to boost your productivity, quit wasting time the next time you look in the closet to decide what to wear, and look good to be productive! I’d love to hear your thoughts on how these wardrobe hacks help you, and please leave a comment if you have any more ideas that you can share with other sisters.